Fire Season has ignited at InanItah, and with it has come inspiring workshops, volcanic sunsets, decadent cacao ceremonies, and a burgeoning community of volunteers and visitors from all over the world. 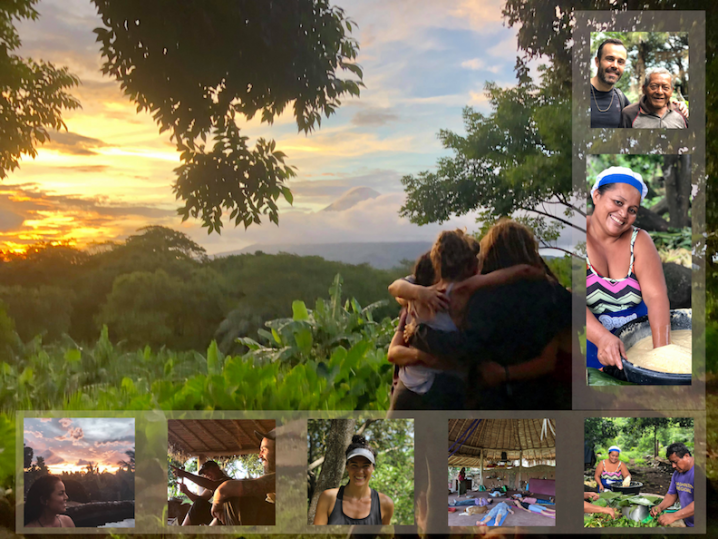 Despite the Nicaragua’s recent turmoil, we are thriving here on Ometepe – learning, serving, growing, dancing, meditating, healing, planting, building, and cooking up meals prepared with love, creativity, and local ingredients. In response to the country’s political crisis, we launched the Ometepe Food Security Program, feeding the hungry bellies of 300 local kids per week since June. Phase 2 of the program – in which we’re collaborating with island residents to co-create a repertoire of recipes sourced from local fruits and veggies – has just commenced. InanItah favorites like yucca flatbread and rich cacao-coco bliss balls are in the mix! The Tantric Opening, one of Gaia’s many boundary-pushing workshops, wrapped in August, offering attendees a safe space to cultivate intimacy, explore self-love, and experience personal discovery and awakening. Our Shamanic Healing Course, led by the insightful (and hilarious) Vinod Quetzaalcoatl Ibex and held earlier this month, allowed participants to learn core shamanic techniques, meridian balancing, group massage and kinesiology, and recognize that above all, true healing is a journey inside – and through — the self. Inspiration and exploration continue in November with more workshops on tap: the Ayurvedic Yoga Massage Training, the 5Rhythms Chakra Journey, and the legendary Tantric Way Series. Despite the fact that it’s technically “rainy” season here on Ometepe, lately we’ve been blessed with clear skies, sunny afternoons, and pastel-colored evenings, which make visits to the pool and hot tub all the more alluring! Our community is alive and expanding here at InanItah. Come to be a part of the Fire Season as a Visitor or Volunteer— we’re looking forward to you joining us!